A while ago our neighbours tore down some trees and left us no privacy to the west of the house. So we added three feet to our fence. 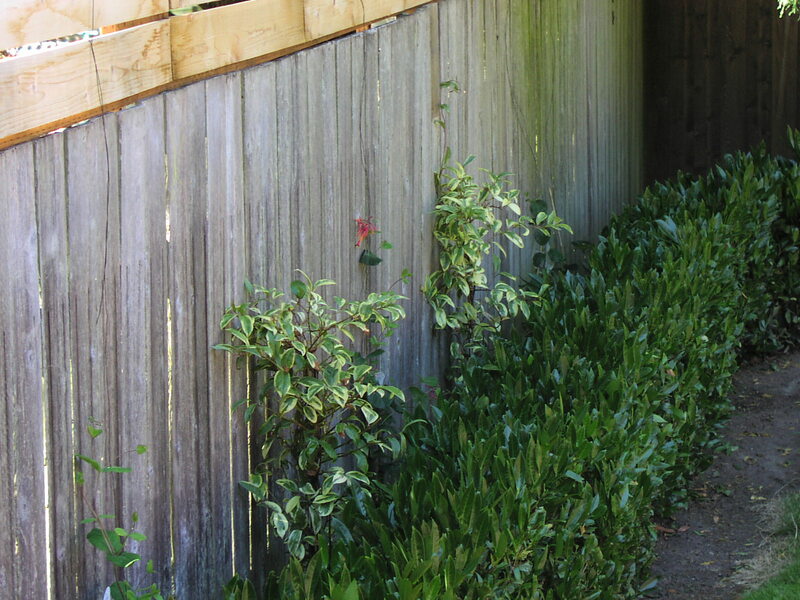 Now we’ve added climbing vines to the fence: honeysuckle and variegated kadsura. (I wanted honeysuckle and clematis, but at the nursery the clematis looked pretty sad.) They’re not much to look at because they only went in a few days ago. But they’re going to grow fast. One honeysuckle is already blossoming. (That tiny red splotch is a flower. Really.) Despite watching like a hawk, no hummingbirds have appeared. Perhaps it’s the hawk thing. We have three different kinds of honeysuckle, some evergreen, some ‘semi-evergreen’ (somegreen? ), some fragrant, some not. They should end up a mix of red, pink, and orange but I admit to very little faith in nursery labels. The marjoram and thyme are going like gangbusters. The parsley is vigorous. 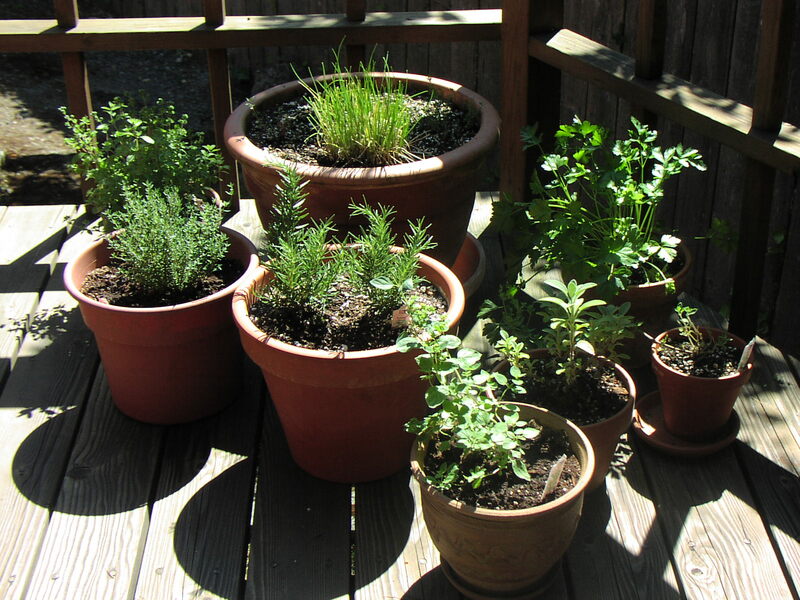 The oregano, sadly, has some kind of blight, so I’ve planted a new one (in the fancy pot). The severely hacked-back chives are shooting up again, so I’m hoping we’ll get enough August sun to produce more tasty flowers. 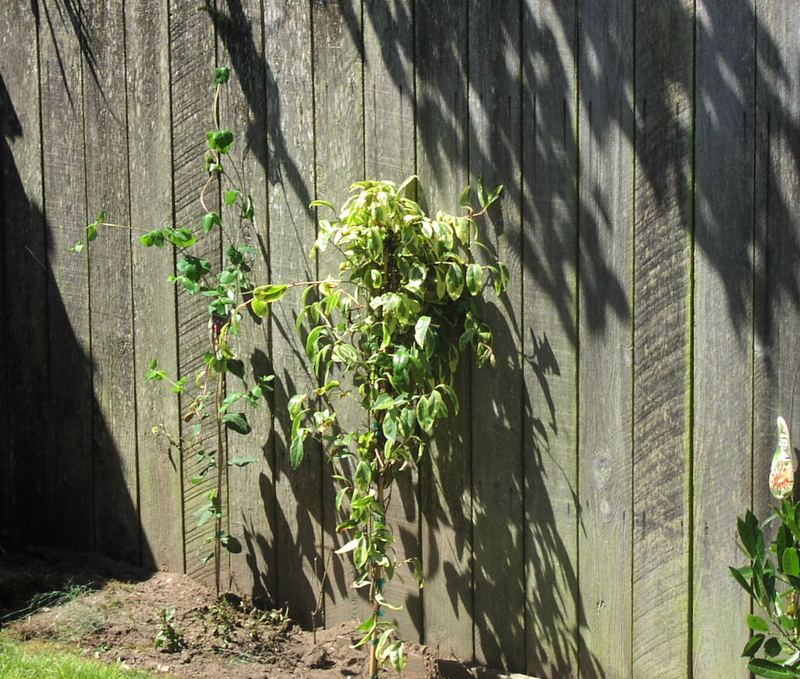 If you watch Craig's List, you'll see free Clematis in your area pretty often. You can always add clematis later, let it climb through the rampant honeysuckle?